Ametrica started in 2010 with the purpose of promoting dialogue, intercultural sensitivity, and friendship between first year domestic and international students. 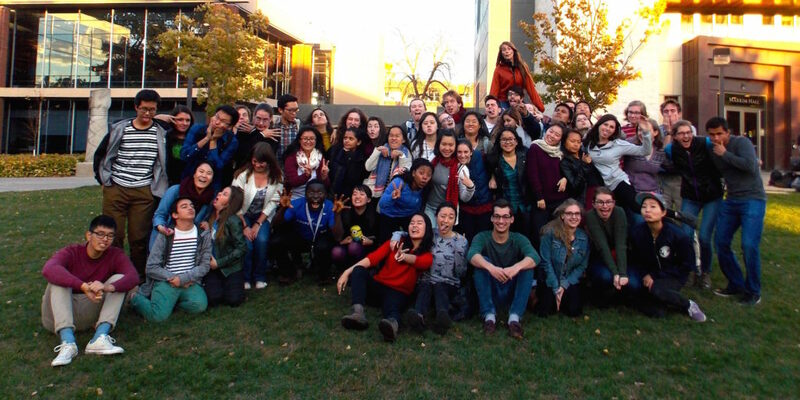 It is a program of Macalester’s International Student Programs (ISP) and is facilitated by a small, diverse group of returning students. The format changes every year, but always includes weekly conversations and activities in the Twin Cities and beyond! In 2019, all domestic Ametrica participants will arrive on Monday, August 26 for Pre-Orientation for International Students (PO4IS), meaning that they will take part in Ametrica and other activities alongside their international peers until all student orientation begins. Weekly sessions take place every Thursday afternoon (4:30-6:30 pm) during the first 7 weeks of the Fall semester. The central component is dialogue in groups of 5-8 students about a range of themes pertinent to students from around the world, allowing them to examine topics through different lenses. Previous topics have included family, peace, current events, law and order, economics, health, race and love. In the place of or in addition to the weekly sessions, Ametrica participants also venture to off-campus locations a few times during the program. Previous activities have included a scavenger hunt, dinner at Macalester Staff/Faculty/Alumni homes, and a trip to Chicago over Fall Break. Both domestic and international Ametrica participants are assigned ISP peer mentors, as an additional link to the Macalester and ISP community (check the Mentor Program link for details). Actively engage in all planned activities, including but not limited to Thursday sessions. On top of intriguing weekly dialogues and engaging activities, many previous participants have said that Ametrica was a critical stepping-stone of their Macalester experience and beyond. Most alumni of Ametrica state that their favorite aspect was that they came away from the program having built valuable friendships, often lasting the rest of their Macalester years. This, along with periodic outings and activities, is where the cross-cultural magic happens! When finalizing your course and extra-curricular schedules, be mindful that you commit to meet at this time every week for Ametrica. At a later date, you will also commit to dates for other activities. Saturday, February 22 International Kidsfest! (optional) Ametrica participants can design booths and activities to teach kids about different countries.